Let's add your casino or club to this list. Hypnosis is one of the most popular things you can present at a fair and C.J. Johnson is one of the best. C.J. 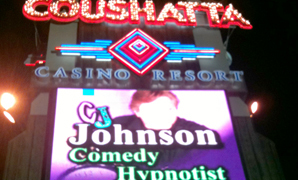 did a full month at Coushatta Casino and Resort in Kinder, LA. By the end of the run the room was filled with people who had seen the show before and were coming back with their friends. Many of them for the third or fourth time!This is the type of appeal that C.J. 's comedy hypnosis show has - people want to see it again and again. Why does C.J. get called for events like this? Because anyone can do the easy shows, but it takes a seasoned professional with the experience of thousands of shows to give a good show each and every night. Steve Martin says in his biography "Anyone can be great from time to time, but a pro is good every night". That's what C.J. is... a pro. Nightclubs, bars and Comedy Clubs are a great place to see C.J. Johnson. It's where he gets to let his hair down a little bit and not worry quite so much about keeping everything totally 100% clean. Now don't get us wrong, C.J., even in these permissive environments, never does a "dirty" show, but he does allow things to get a little looser when working where alcohol is served! Hypnosis shows are a great break from music or from traditional "stand up" comedy nights, and best of all, people will come back again and again to see a hypnotist, whereas, they'll typically only see a comic once during his run. Because of a busy calendar in the corporate and college markets, C.J. takes very limited numbers of club dates each year, but if you want to bring in a hilariously funny show that has huge audience appeal and will PACK YOUR CLUB with paying customers - the give C.J. 's office a call and let's see if we can set up a date - or better yet... a month of dates. The longer the run, the further in advance you'll want to call. Every show comes with C.J. 's full support, show fliers, table tents, posters, press releases, and C.J. will gladly make local TV and radio appearances that you set up to promote the event.